OPEN 7 DAYS A WEEK IN SPOKANE VALLEY! Tap List What's on tap? Growler Care Keep it clean! News & Events For craft beer lovers. Have you found your favorite craft beer yet? Steady Flow Growler House provides a large variety of craft beverages on tap for tastings and on-the-go in growlers in Spokane Valley, facilitated by a knowledgeable staff that can guide you through the style of beverages to find the perfect fit for your palate. Steady Flow Growler House & Tasting Room is a local veteran owned and loved operation with 43 taps for those 21 and over. The tap selection rotates craft beverages from the Spokane Region, the Inland Northwest, and around the beautiful United States of America. Our tap list emphasis is on seasonal beers, limited releases, brewery collaborations, and the favorite local craft beer, root beer, cider, kombucha, wine, and cold brewed coffee. We love growlers because it is a great way to get small batches and beverages that aren't bottled to your destination for enjoyment! We also love to mention, that since they are refillable, they are an environmentally friendly option. Growlers are the specialty here; however, we understand that to fully appreciate a beer sometimes you need a half-pint or pint before filling a growler, which is why we chose to create a space for that as well. We want to know that when you are home enjoying the beverage you chose to fill your growler with, that it's exactly what you tasted at our store. Well, you made it this far so you've heard about our growler house, thank you for visiting! Now, I suppose you want to know a little something about the owners (hence the name of this section... right?). Well, the owners (Ashton and Cassie) are both veterans and they both have a love for craft beer, craft cider, bubbly kombucha, good wine, and who doesn't need a good coffee for the morning!? For any more dirt on them you’ll have to stop by for a drink and a visit. So, why did they decide to open a growler fill station and tasting room? Well, after they finished serving our great nation it was time for each of them to start a new adventure. Around that same time the craft beer movement was making its way into Spokane with a bang. After visiting a few local breweries and a few more months of ‘field research’ they were filled with information, a fair amount of beer — but best of all, they had the vision to join together to open a venue where they could offer numerous craft breweries under one roof and share them with friends (old and new) here in Spokane! We strive to provide first class customer service. In respect for this, we appreciate that you do not interrupt the storefront during operating hours. You are invited to shoot us a quick email at soliciting@steadyflowgrowlerhouse.com explaining the nature of your business. We do read these emails, and will contact you if we are interested in your services. Thank you for your time! SFGH does make charitable contributions, but in our effort to provide first class service, we ask that you do not interrupt the storefront during operating hours. If you meet these guidelines, please email us at soliciting@steadyflowgrowlerhouse.com with information about your cause and what you are searching for. Thank you! Have you found your favorite local craft beverage yet? WE NOW SERVE FOOD! — We are proud to annouce that we now serve delicious food to accompany your favorite craft beverage! Everything is cooked fresh to order right here in our shiny new kitchen. Visit us to see our seasonal selection of small and large plates including appetizers, flatbreads, & more! Ask us what beverage pairs well with your meal, we would love to give you some suggestions. Caring for your precious growler — after all, without it there wouldn't be that delicious reward of drinking your fresh craft beverage at home! 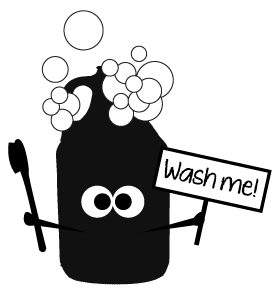 In order to ensure your beverage experience is what it should be, you are responsible for maintaining the cleanliness of your growler while we are responsible for a proper fill of your choice beverage. If you had beer spilled all over you (a travesty!) you would take a shower too right? We'll let it slide if you would try to save as much beer as possible first by licking your arms (we would too!). Keep your growler cold until all of your delicious beverage has been consumed (for the beverage's sake we hope you are doing this already). Once the growler is empty, ensure the detergents you intend to use are not fat or oil-based. Rinse the growler with piping hot water. Three times should do the trick, and get anything that shouldn't be in there, out! Air dry your growler upside down and leave the lid off until you decide to return for a new fill! Follow these same steps for your growler cap, which like all things are meant to be used multiple times but have their lifecycle. When good things come to an end and your growler cap isn't performing to standard, we will provide you with a new cap to ensure proper sealing of your growler. Craft beer quality is of the utmost importance to us. We want to maintain the exact beer the brewer indended. This is why our lines and taps are cleaned regularly and also why we ask for clean growlers from the consumers. For us to ensure we are filling a sanitary container we will "inspect" your growler (by taking a smell & peek). If you haven't been living up to growler standards and we aren't facing a growler rush hour, we wil help sanitize your growler while reminding you of these critical maintenance steps. But if you become a gross growler repeater, or your growler smells like something out of a college locker room, we will ask you to purchase a clean growler to fill with a delicious beverage. After all, we don't want to compromise all the work the brewers put into the beverage you are about to enjoy!  At Steady Flow Growler House we appreciate the hard work that the brewers put into their craft beverages, which is why you will find different styles of beer served in different glassware as well as different styles of glasses available for purchase. We want to ensure the growler of beer you take home tastes the same as it did in the store and glassware contributes to this pleasant experience. Nonic Pint Glasses originate from Europe as the glass of choice for most pints. The rounded flare helps give the glass extra gripping ability but also promotes surface area for the beer to develop more head which concentrates more aromas to the surface for the consumers' first sip. 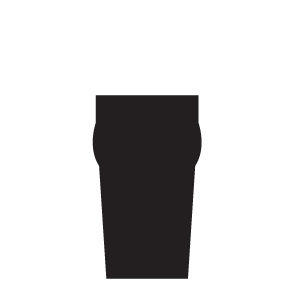 This glass is ideal for stouts and beers with exceptionally creamy flavors. 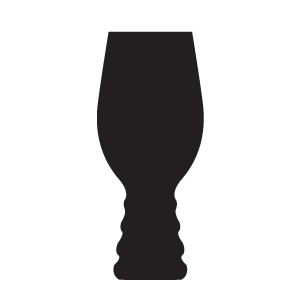 Can be used for most English and American styles of beer to include IPA's under 8% ABV, English Bitters, Porters, Brown Ales, Pilsners, and Stouts. 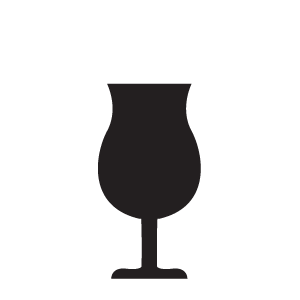 Snifter Glasses are excellent for strong and complex beers with complex aromas. The inward curve concentrates the aroma of the beer to the consumer's nose and the bulb shape allows for room to swirl the beer and release the pleasant aroma of complex hops and malts (beeradvocate.com). Beers best served in this glass are above 8% ABV as well as Imperial Stouts, Scotch Ales, Barleywine, Strong Alex, Belgian Dark Ales, Tripels, Quadrupels, Brrel-Aged, and Belgian Sours. IPA Glasses are specifically designed to bring out the volatile and complex aromas of IPA style beers. This is a fairly new glass to the craft beer glassware market and was developed by leading brewers from Dogfish Head and Sierra Nevada. This IPA Glass is designed to complement the complex profiles of "hop forward" IPA beers, preserve the frothy head, enhance taste and mouth feel, while having a comfortable opening for consumer enjoyment. Beers best served in this are your complex and hop forward IPA style beers. Proper glassware serves to enhance the beverage of choice. You will not find beer served in a frosted glass at the SFGH because when the delicious craft beverage hits the glass condensation will occur, dilute the beer, and alter the serving temperature. This compromises the taste of the craft beverage served. But some might say "Wait! You sprayed water in the glass before you filled it." We are not watering down your beer — we promise! We use the rinse to ensure the glass is perfectly clean with nothing but beer in it. The water is also the same temperature as the beer so that the glass is cooled to the temperature of the beer, conditioning the glass and allowing for an excellent pour. 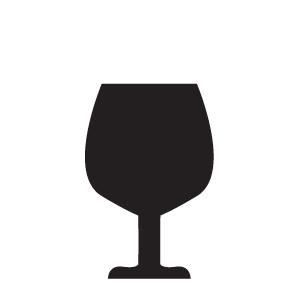 For a more extensive list of glassware check out BeerAdvocate which takes glassware and beer pairing to the expertise level. growler koozies, & more right here at Steady Flow Growler House! 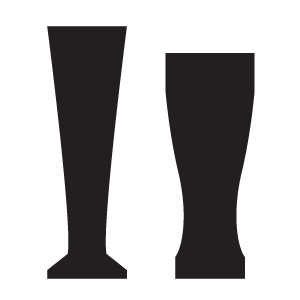 Tin pails, pitchers, glass jars or jugs, and other vessels are used to carry beer home from the local pub, most common being a 2-quart galvanized or enameled pail. These "growlers" supposedly got their name because as the beer sloshed around, it caused the carbon dioxide to escape and create a growling noise. Prior to WWII, children would bring covered buckets of beer from the local pub to workers at lunch time, or to their parents at dinner time. This became known as "rushing the growler". The "Bucket Trade" was in action during the years leading up to Prohibition, until growlers were outlawed entirely. The tin pail had been phased out and waxed cardboard containers with lids were being used. By the 1960s, however, most bars had switched to plastic containers and were now allowed to sell pre-packaged beer after hours, so the concept of the growler slowly disappeared. Charlie Otto, owner of Wyoming's first draft-only microbrewery, wanted to offer beer to go, but couldn't bottle it. Luckily, his father remembered the use of growlers and suggested they try them. So he printed his logo on half-gallon glass jugs and the growler as we know it today was born! Recommendations? Kudos? Contact us Below! We love to hear from our customers and fans - leave us a message below and we will get back to you shortly!